Today, TMP joins in on the William Wellman Blogathon, a celebration of one of classic Hollywood’s great directors. This event is hosted by Now Voyaging. Head over to the event page for links to all of the fantastic articles about Wellman and his films! 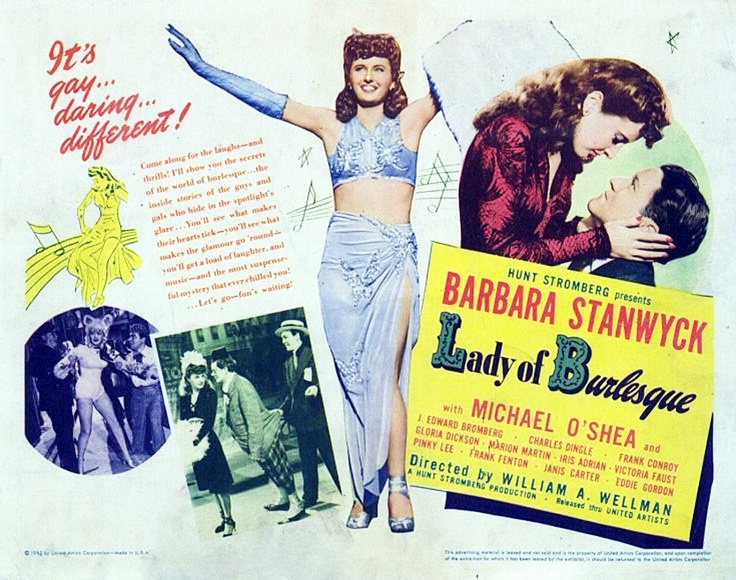 Synopsis: Based on Gypsy Rose Lee’s “The G-String Murders,” Lady of Burlesque follows Dixie Daisy (Stanwyck), a dancer who becomes one of many suspects when a fellow performer is murdered. Unwilling to take the fall for a crime she didn’t commit, she sets out to solve the crime herself and find the real killer. Ranked 1st because: I have a little bit of a bias toward this film, I’ll admit, because it was my first Stanwyck film. I loved it the first time I watched it, and it helped turn me into a fan of Missy; I still love it, after many years and multiple re-watches. Even with my bias put aside, there’s no denying that Lady of Burlesque is a highly-watchable, fun film. Fast-paced and genuinely mysterious thanks to Wellman’s directorial efforts, the film is made even better by its incredibly witty script, keeping the mood bright and the dialogue sassy (despite the death and gloom plaguing the Old Opera House). Synopsis: Lora Hart (Stanwyck) and her best friend (another TMP favorite, Joan Blondell) are being certified as nurses. After spending some time as hospital trainees, Lora gets a job as a night nurse for two children, her friend working as day nurse in the same household. When they realize that the children are being mistreated, Lora enlists the help of a criminal pal to save them. Ranked 2nd because: When I first reviewed this film along with The Purchase Price in 2012, I rated both as 4/5. In the 3.5 years that have passed since, and after a re-watch or two, I’d re-evaluate Night Nurse as a 4.5/5. What a great little pre-code picture! Quick-paced, tightly-constructed, equal parts thrilling and witty, Night Nurse can easily be counted among my favorite films from both Wellman and Stanwyck. Synopsis: Behind every great man stands a great woman, and Hannah Hoyt is the great woman behind Ethan Hoyt, founder of Hoyt City and legendary pioneer. As an elderly widow, Hannah recounts the story of her life with Ethan to a young woman who is hoping to write a biography about Ethan. 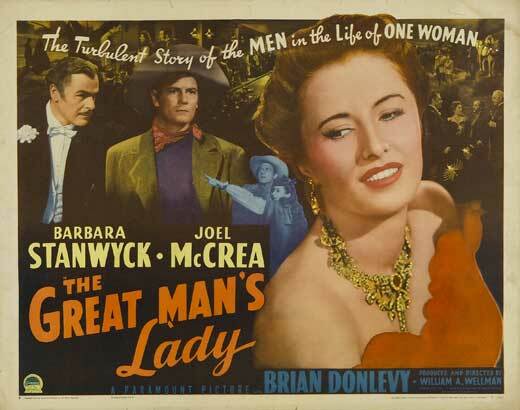 Ranked 3rd because: A sweeping exploration of several decades and countless struggles throughout one woman’s life, The Great Man’s Lady includes a Stanwyck performance that ranks highly on my list of personal favorites. As Hannah Hoyt — arguably one of her strongest and most admirable characters — she captures the viewer’s attentions and emotions completely. Wellman both directed and produced the film, and according to TCM, Wellman and Stanwyck each considered this to be their best work together. On my list, it ranks third. It’s not quite as fun as Lady of Burlesque or as thrilling as Night Nurse, but The Great Man’s Lady is still a pretty wonderful watch. Synopsis: A showgirl (Stanwyck) ditches her New York life and gangster boyfriend, moving to a farm as a mail-order bride. Struggling to adjust to rural life, she must also attempt to build a relationship with the husband (George Brent) she barely knows. Ranked 4th because: Some elements of the story are a little difficult to buy (why would Joan put so much effort into her strange new marriage when her husband at first seems so disinterested in her? ), but these little issues are remedied by the fact that Stanwyck’s Wellman-directed performance makes her character so easy to care for and root for. It’s clear that she wants to make this arrangement work and stay on the farm, and as a result, she’s very easy for the viewer to sympathize with. Little new ground is broken in this somewhat-predictable “bad girl gone good” tale, but the performances make the film very enjoyable to watch. 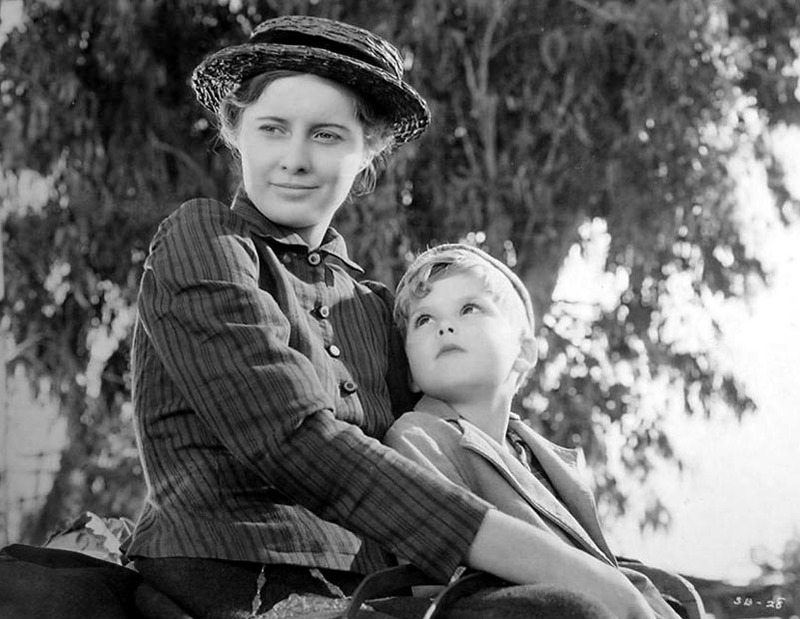 Synopsis: After her gambler father dies, Selina (Stanwyck) is left with no way to support herself and no one to turn to. Knowing that she must find a job and a home, she decides to move to a rural town and become a teacher. She soon strikes up a romance with farmer Purvis De Jong (Earle Foxe) and marries him, but finds that life as a farmer’s wife is a lot more difficult than she expected. Ranked 5th because: So Big! 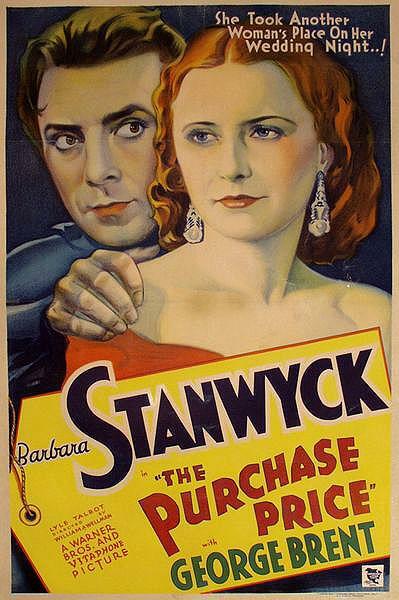 is in many ways similar to The Purchase Price — directed by Wellman, starring Stanwyck, released in 1932, and the story revolves around a farmer’s wife. This one earns the lower ranking of the two due to its slower pace, and the fact that it suffers from a shallow level of detail, packing several decades of life into an 81-minute run time. (This problem was avoided with The Great Man’s Lady.) All is not lost, however. Stanwyck gives one of her usual fantastic performances, with shades of Stella Dallas-esque emotion in the second half. Her character is a strong, fascinating woman. Also on the positive, Wellman does a great job of emphasizing the hardships of farm life over the more standard romantic storylines that exist in the script. 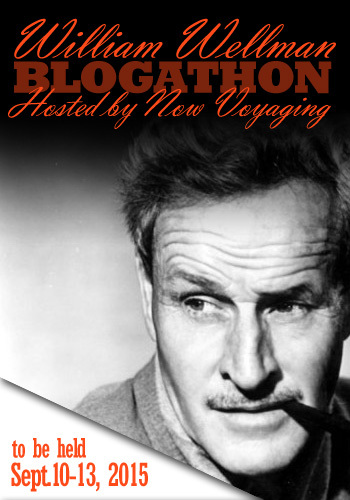 And again, don’t forget to visit Now Voyaging for more Wellman celebration! Loved this post! And how great that Lady of Burlesque is your number one pick! Thanks for joining the blogathon! Glad you enjoyed the post! :) Thanks again for hosting! Great piece! I’ve also seen all of these – I think my favourite is probably The Purchase Price, then Night Nurse, but they are all great to watch. Can certainly see why you love Lady of Burlesque. I believe ‘So Big’ had a lot cut out somewhere along the line, so that might be why some of it feels so shallow, as you say. 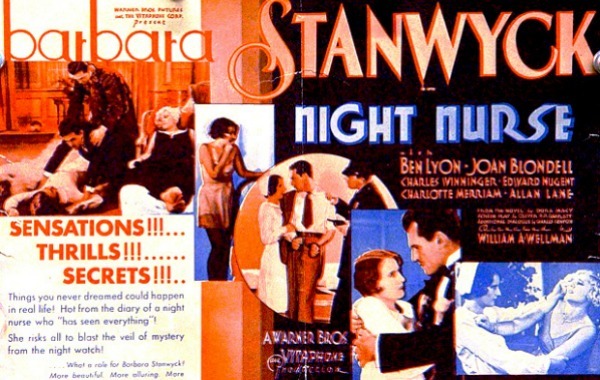 Your Barbara Stanwyck Filmography project sounds like a great idea – I’d love to see all of her films.